Virmati Software & Telecommunications Ltd. Caters to the speedy delivery of Government Services to the large base of people across different segments and geographical locations. The need to transform HR into a strategic function within an Organization is one of the key success factors for any organization today. Virmati has developed to enable the evolution of HR from an administrative function to a critical role that is actively involved in management leadership, planning, and decision-making. In every Organization, it is critical to empower employees to know more, learn more and in turn, perform more. The Virmati’s web based application is that answers this need. It acts as an electronic hub to centralize all your human resource-related processes - including communication, development, benefits entitlement and compensation. Virmati offers a complete HR suite which acts as a central employee database and this enables HR administrators to utilize all employee information productively. Recruitment refers to right person at the right job. Recruitment module helps to create requirement, candidate entry, recruitment process and appointment. We can recruit staff from multiple sources like newspaper, thru reference, employment exchange etc. it covers all the standard processes like multiple interviews, ranking, police and physical verification etc. PIS Module is very important module in the system. From PIS we can add employee directly without recruitment process. This module maintains database of employees. It covers the personal details as well as all important landmark details during the tenure for decision making about transfer, promotion, increment, training and so on. It is multilevel user access, and permission according to fully customizable. It is menu driven and user friendly interface. Generation of report in user define format. This module contains all details about the Employee leave data. Individual Leave account is handled under this module. Once employee is appointed he has been allocated leaves. Leave will be assigned as per the designation and grade of the employee. 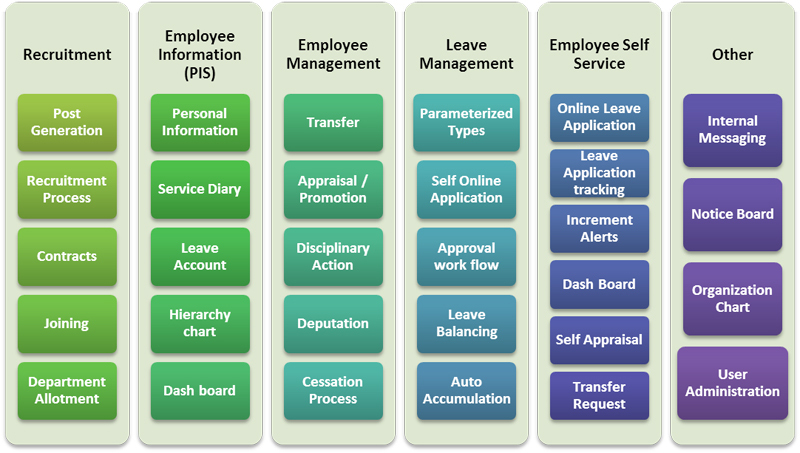 The System maintains database of Leave for each & every employees. It covers types of leave, Calculation of Leave, Eligibility of leave and the leave balance after deducting the availed leave by the employees. The module is maintain & governed according to users given rights. User can put any notice, Alert common to all or to a specific user. Messaging system, Can deliver or receive any instant message from any user. User can put offline messages also. Virmati, is an established & renowned Software Technology Provider in Banking & Financial Industry, having partnered with Leading Financial Institutions & Business Associates over years. True to its character of a technology pioneer & enabler, Virmati works with Financial Institutions, System Integrators and IT Consulting/Advisory Firms to introduce class leading IT Solutions - solutions that enable customers to experience impact and to bring about transformation in their business and strategies. Followed after excellent project services & delivery, is value defining post-delivery support or annual technology support from Virmati - something which has been exceptional and well appreciated by customers and partners of Virmati over the years. Technology association with Virmati ensures that Customer’s IT Systems remain vibrant, updated & agile to pro-actively respond to ever-changing market conditions. As a specialized financial solutions provider over two decades, Virmati brings along immense experience & domain knowledge not just in the architecture & design of solutions, but also in their adoption, utilization & successful impact to the customer. [Training & Learning Center] A-2/3, Arjun Tower, Ring Road Cross, Satellite, Ahmedabad - 380015. (Gujarat) INDIA.